HydROtwist ZIP Industries 91240 compatible Sub Micron Triple Action water filter. Premium replacement filter with the same watermark testing..
HydROtwist Premium Replacement Filter to suit ZIP Industries Model 91241. 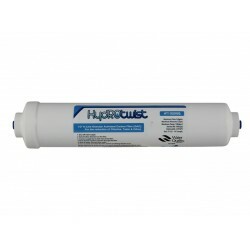 The HydROtwist Compatible 91241 water filter cartridge is an affordable .. 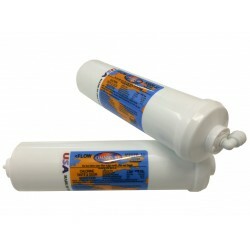 Here you will find a range of generic and American made filters to suit a range of fridges. Omnipure 1 Micron genuine K5520 Inline Water Filter This filter is suitbale for ice makers, refrigerators, beverage equipment, drinking fountains, under the counter systems, R.O. Systems and in conjunction with purification systems. Suits all fridges that use a 2.5" diameter in-lin..
2 x Omnipure K5520 SS Carbon Block Fridge Filter Elbow QC 1/4"
2 x Omnipure 1 Micron genuine K5520 Inline Water Filter This filter is suitbale for ice makers, refrigerators, beverage equipment, drinking fountains, under the counter systems, R.O. Systems and in conjunction with purification systems. Suits all fridges that use a 2.5" diameter in..
4 x Omnipure K5520 SS Carbon Block Fridge Filter Elbow QC 1/4"
4 x Omnipure 1 Micron genuine K5520 Inline Water Filter No Shelf Life This filter is suitbale for ice makers, refrigerators, beverage equipment, drinking fountains, under the counter systems, R.O. Systems and in conjunction with purification systems. Suits all fridges that use.. The HydROtwist In Line replacement inline fridge Water Filter effectively reduces Chlorine, Taste & Odor, Rust, Dirt and Sediment. Installation instructions included directly on the filter. Will suit most Fridges that use an external inline filter. 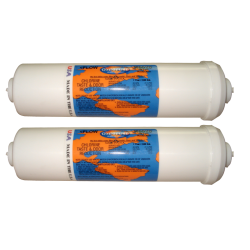 Please note: If you fridge did not co..
2 x HydROtwist Stefani Compatible Fridge Filters to suit Model # IC-100Q-FRG The HydROtwist In Line replacement inline fridge Water Filter effectively reduces Chlorine, Taste & Odor, Rust, Dirt and Sediment. Installation instructions included directly on the filter. Will suit most Fri..
4 x HydROtwist Stefani Compatible Fridge Filters to suit Model # IC-100Q-FRG The HydROtwist In Line replacement inline fridge Water Filter effectively reduces Chlorine, Taste & Odor, Rust, Dirt and Sediment. Installation instructions included directly on the filter. Will suit most Fri..
Inline Fridge Filter GAC Activated Carbon suit Amana Fridge 1/4"
The In Line fridge Filter effectively reduces Chlorine, Taste & Odor, Rust, Dirt and Sediment. Installation instructions included directly on the filter. Will suit most Amana fridge's that use an external inline filter. Please note: If you fridge did not come with a Pressure Limiting Valve (PLV)..
Inline Fridge Filter GAC Activated Carbon suit GE Fridge 1/4"
The Inline Fridge Filter effectively reduces Chlorine, Taste & Odor, Rust, Dirt and Sediment. Installation instructions included directly on the filter. Will suit most GE fridge's that use an external inline filter. Please note: If you fridge did not come with a Pressure Limiting Valve (PLV) its..
Inline Fridge Filter GAC Activated Carbon suit Kleenmaid 1/4"
The Inline Fridge Filter effectively reduces Chlorine, Taste & Odor, Rust, Dirt and Sediment. Installation instructions included directly on the filter. Will suit most Kleenmaid fridge's that use an external inline filter. Please note: If you fridge did not come with a Pressure Limiting Valve (P..
Inline Fridge Filter GAC Activated Carbon suit LG Fridge 1/4"
The Inline Fridge Filter effectively reduces Chlorine, Taste & Odor, Rust, Dirt and Sediment. Installation instructions included directly on the filter. Will suit most LG fridge's that use an external inline filter. 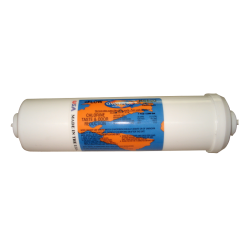 Please note: If you fridge did not come with a Pressure Limiting Valve (PLV) it..
Inline Fridge Filter GAC Activated Carbon suit Maytag 1/4"
The Inline Fridge Filter effectively reduces Chlorine, Taste & Odor, Rust, Dirt and Sediment. Installation instructions included directly on the filter. Will suit most Maytag fridge's that use an external inline filter. Please note: If you fridge did not come with a Pressure Limiting Valve (PLV)..
Inline Fridge Filter GAC Activated Carbon suit Samsung 1/4"
The Inline Fridge Filter effectively reduces Chlorine, Taste & Odor, Rust, Dirt and Sediment. Installation instructions included directly on the filter. Will suit most samsung fridge's that use an external inline filter. Please note: If you fridge did not come with a Pressure Limiting Valve (PLV.. Copyright © 2019, Tru Water, All Rights Reserved.